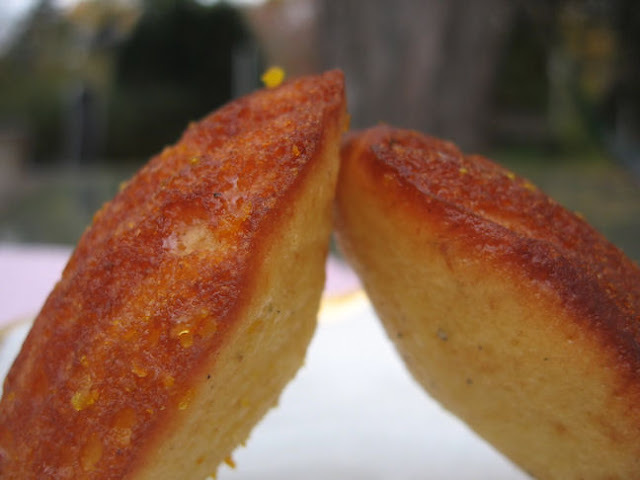 Foodalution: Orange Cardamom Madeleines - The Feel Good Cookie! Orange Cardamom Madeleines - The Feel Good Cookie! Mmmmuah! Buttery delicious with the exotic taste of cardamom and orange! Sometimes there are things in life that we do... just because they make us feel good. We all have a bit or a bunch of that "feel good" DNA coursing through our veins..oh wait.. maybe that is just my addictive personality. Either way, feeling good feels good. I love the high of having everything work our perfectly in a day or somehow feeling one step ahead of myself rather than one step behind. I love having the phone ring and knowing it is my sister before I even glance at the caller ID. Life can feel oh soo good. Right? 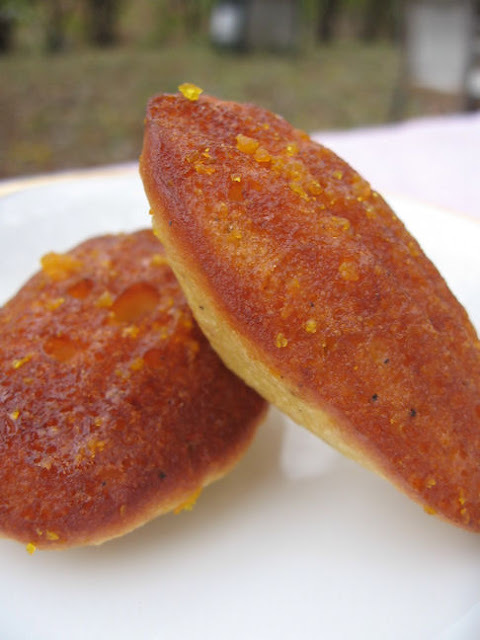 Cuddling with my kids feels good....kissing my husband on the soft curve of his neck feels good, breathing in the cool autumn air feels good, eating an orange cardamom madeleine feels really good. Sometimes we bake something so wonderful, we eat them all up, at once. That is what happened today. All gone. Sorry, no leftovers... not one. This dreamy little recipe has been on my "to-do" list for quite some time, possibly two years. Why so long you ask? You see, there are little delicacies in the world of baking and cooking. There are those "must have" items that you put off buying because your children need socks and underwear. Priority = socks and unders for the kids, not the cute little seashell shaped Madeleine pans? Socks and underwear usually win..... until yesterday! Ahhh yesterday, all my troubles seemed so far away because I splurged and purchased two lovely Madeleine pans. I could finally create the cookie I had been dreaming about for years! Was it the special cake shape I craved or the orange cardamom flavor combination, or possibly the memories of the summer of my 16th year where I ate Magdalenas every day on the warm and sunny Costa Brava in Spain? Who knows... but I promise you this, one taste of these orange glazed goddesses' and you will be feeling so good your children will ask you..."Mother, why are you being so nice to me?"! I Feel Good... very good....even the thought of these cookies ignites some inner thrill inside me. My husband has some competition on his hands! I have an orange cardamom mistress! These cookies/cakes were absolutely delicious. My expectations were exceeded, if not blown away. 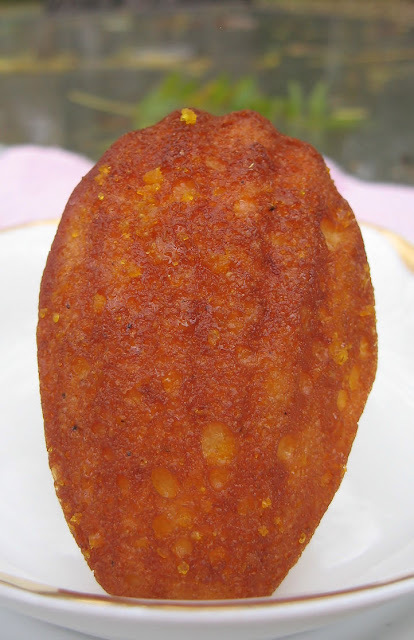 Mmmmmm, all day I dream about orange-cardamom madeleines....! 1) Butter molds of the madeleine pan. Oven to 325. Melt butter in small sauce pan, add in vanilla, cardamom, and honey. Let cool 10 minutes. 2) Whisk flour, baking powder, and salt in a small bowl. 3) Stir eggs and sugar in a medium bowl. Add in flowr misture until combined. Add butter and spice mixture, stir until combined and lumps are removed. Cover with plasitc wrap and refrigerate for about 30 minutes. 4) Spoon batter into madeleine pan, filling each mold just half way. It is easy to want to fill the entire mold, but they will be more delicate and light if you let the batter fill the mold while baking. Bake just until the edges are golden about 7-8 minutes. Let cool a bit and then put onto rack to cool completely. 5) Zest the orange, and place zest, juice and sugar in a small pan. Turn burner on low until sugar is dissolved and immediately coat the Madeleines with the glaze. Use a pastry brush and be generous. Let set for about 15 minutes... if you can wait that long. 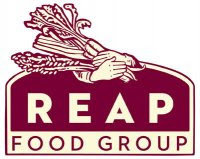 Eat right away or store for a late night snack! Madeleines, Magdalenas , Madelines.... you name it.. they are delicious! it does feel good when you do/buy something for yourself huh? Last weekend my hubby told me "we will go to williams and sonoma and you will get something for you!" and I got a candy/frying thermometer. It felt really good. 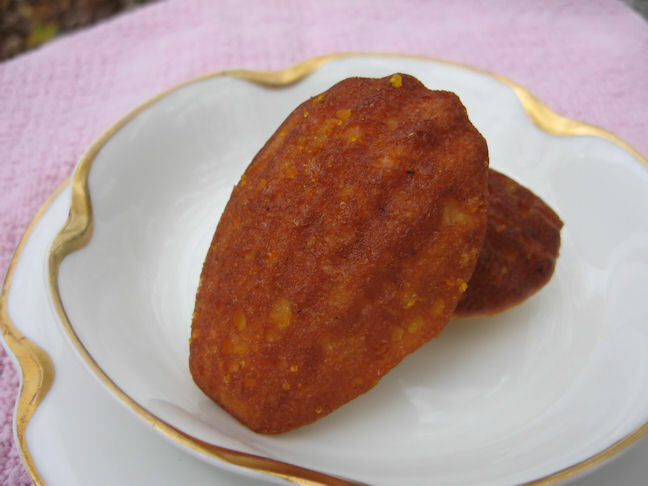 If you made these wonderful madeleines with your gift to yourself I bet you feel wonderful! I love the orange and cardamon combo! These are so pretty! What a great golden color they have. Buttery goodness! Sometimes it really is the simple things in life that make us the happiest. Love the orange and cardamom--great flavors! How light and tasty and buttery and yes, please - I shall put this on my list. How grand to find a new cookie. And I always write down waiting room recipes. Although usually the ones I want... have been torn out. Oh, they really do sound fabulous! These sound so good. I have yet to use my 2 brand new Madeleine pans. Will have to make these soon. Life is a little crazy at the moment. I adore madelines, and these flavors are so unique! Mmm! I love cardamom, and your madeleines looked so moist and yummy! Plain madeleines have never really done it for me, but these look truly delicious and worthy of buying the special pan for! Well baked and looks so good- I definitely will feel good if I ate a couple of them now! Megan, this shall be on my to do list, as soon as I get my long-awaited madeleines pans. I just got my first silicone financiers mold two days ago after eyeing this mold for soooo long! Madeleines and ramekin molds are on the top of my baking pans list now as soon as budget allows! Thank you for sharing this recipe! I'm not a bit surprised that there were none left over!!!! I love madelines, they are so elegant and French and make me feel like I am much fancier than I really am. I would like to think I could have the same restraint as those perfectly coiffed French women, but I don't, I would eat the whole batch. These look absolutely divine! I've never made madelines before but I think this recipe is going to change that for good... Thanks for sharing! Orange and cardamom are a superb combo! Awesome! Megan, glad that you finally back on track. And these madelines looks super yummy. Thanks for the recipe. 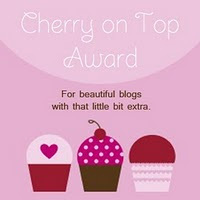 Btw, I have an award for you. Please feel free to hop over to collect it. Hope you're having a fabulous day and enjoy the nice sutumn breeze. Thanks! p/s will try to write soon! Cheers! I tagged you in my post lady! It's answer time! Your madeleines look wonderful -- a little taste of France! this are such lovely madeleines.. i really love the flavor combo in here. thank you for sharing this. have a nice weekend.